Thank you Veterans and Dementia Care Partners for your service. Whether we serve for love of country or family, if we end up on the front lines, we are risking life and long-term health. This past weekend, I tuned in closely to the TV programs about post 9/11 veterans living with the invisible wounds of war. Our “Mums the Word” program, November 11, 10am – 2pm, at our home, served six. 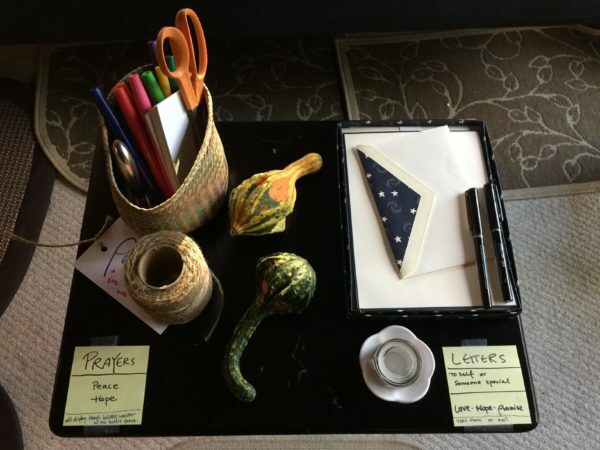 In addition to offering our wheelchair-accessible gardens, we offered four expressive writing activities: peace prayer flags, a war & peace story snippet quilt, a “purge & merge” station, and letter-writing. One action item from this past weekend for me is to create a “Veterans Programs Planning & Outreach Committee.” I’m calling all locals (North of Boston) interested in a first meeting TBD January 2018 to please contact me via e-mail or phone. Future veterans programs at our home and gardens may include: horticultural therapy for vets living with PTSD and an expressive writing group. ← 2016 Annual Report ~ Read it and Celebrate!